What is education? It depends on whom you ask. For some, the goal of education is to create well-rounded individuals capable of critical thought. Others see it as a necessary prerequisite for participation in democratic government. Traditionalists will tell you that education is about forming moral character. Meanwhile, more pragmatic minds understand it to be a process of merely preparing children for the workforce, industrial or otherwise. But with schools across the country failing and teachers beginning to take to the streets, this perpetually broken system deserves a look. The trouble with talking about education is that it’s the closest you can get to the third rail of topics, combining parenting, politics, religion, race, class, and a whole host of other conversational danger zones—then add in a healthy dose of misinformation and voilà! You have today’s complicated education policy landscape. But unlike the discourse around curricula, prayer, and whether to force children to pledge their allegiance to a piece of cloth, we are now facing the dark side of policy. And not just as a methodology mind you, but this time, as a movement. As Sarah Bluver explores in her piece, it was Al Shanker, the president of the National Teachers Union who in 1988 had suggested a new kind of school that would be publicly funded, but managed internally. He envisioned a project where educators could be experimental, allowing them to identify the ‘best’ instructional methods which then could be brought back to public schools. So yes, “Charters were first and foremost the brainchild of teachers unions, the very same groups that would become the schools’ greatest foes.” The very corrupted movement that is decimating an already complicated and difficult public system is turning into a failed experiment co-opted by those with visions of the future who seem to always leave out what’s actually happening right now. Anyone actually working in a public school can see that the original vision behind the charter school movement doesn’t match the government’s eventual execution. The American public has been sold on educational theory, not fact. This has resulted in societal misconceptions that must be debunked, otherwise public education will continue to deteriorate in future generations. The first myth stems from widespread ignorance in regard to what charter schools are. For instance, there is a common belief that they’re a new form of private schools. This is simply not true. The government funds charters the same way they fund public schools. And with the same money. The difference is that charters aren’t held to the same curriculum standards or discipline practices as their public counterparts, and these disparities have fostered vast skepticism and resentment among public educators. And that’s just one view. To counter the argument, Adam De Gree takes us through the history of how the pioneers and the one-room schoolhouse eventually turned into the public school system we have in place today. He asks, “does education mean learning accepted forms of behavior? Or does it mean trying to open minds? Maybe the whole point all along was to keep minds in check, while being taught useful repetitive skills.” Thanks to the new standardized schooling, corporate America was no longer hampered by the local values that once colored the nation’s cultural landscape. 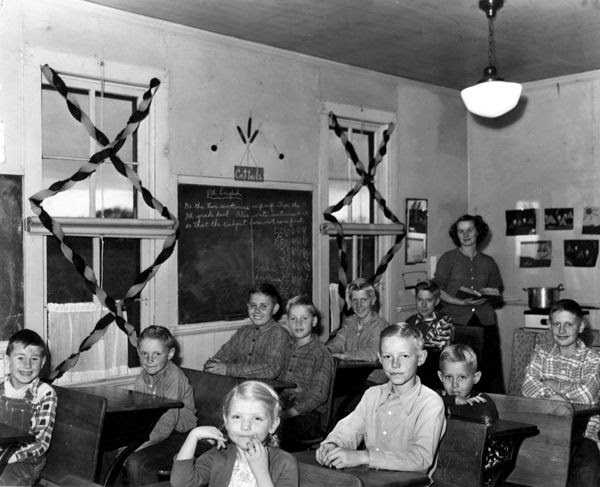 The character education of the one-room schoolhouse was in many ways replaced by indoctrination into the secular cults of nationalism and consumerism; public schools were to be the Great Americanizers of foreign immigrants. But while American consumerism may have run amuck, our ability to assimilate immigrants is arguably one of our society’s greatest strengths. Students, taught in batches by age, graduated both as model workers and model patriots. They were trained in submission before arbitrary authority and were accustomed to repetitive, time-consuming tasks. Schools even imported the infamous bells from the factories where they were used to make it easier for managers to control their production lines. Today, the bell has rung on one-size-fits-all schools. In a nation where 44 million parents can’t read a bedtime story to their kids, people are waking up to the fact that there is no one-size-fits-all approach to something as complicated as education. Even public school advocates agree that the system is broken. The question now is, how can schools be reformed? Can we escape their corrupt origins to build something worth saving? So for De Gree, School Choice is an antidote to the core assimilation values public schools meant to instill. “It’s clear that unique communities have unique needs; needs that are sometimes best understood from within the community. When it comes to education, things are no different. The people who are often best equipped to make choices about the educational needs of children are locals. Simply put, local communities knew what they needed, organized, and made it happen. Unlike the obedient serfdom of Europe, Americans defied the odds, time and time again, to come together and solve their own problems in any way they saw fit. If there was ever anything exceptional about America, that was it." And it doesn’t get any more local than parents. That being said, not all parents are equipped to navigate the complicated systems, rampant misinformation, and school board politics that are in place today. Otherwise we wouldn’t be suffering from the 21st century resurgence of certain infectious diseases and the endless arguments over morality in curricula. In any case, culture, local or otherwise, plays a big role in all this. So what comes next? Is all hope lost, or can American education be saved from itself? Not all charter schools are bad, but when considering the sentiments that sparked their rise to prominence, a logical solution is clear. A lot of this debate has to do with the relationship between schools and parents, and the fact that people are somewhat being misinformed from all sides. Maybe society needs to just focus on improving what is, rather than getting lost in the idle fantasy of what could be. And educating the public about the truths of both public schools and charter schools would be a great place to start. Otherwise, someday, the students might take it all on themselves. There’s no doubt that the imagery and ideas around public school are an integral part of American cultural history, as seen in every teen movie ever made as well as a music video or two, or ten. This we can all agree on. Just take a look at Vince Lombardi High, you know, that school that had the lowest academic standing in California, but still rocked? We’re talking about Rock 'n' Roll High School, of course. The film where Ramones-loving students induce mental breakdowns on their revolving door of principals. And just like that the student movement was suddenly born again. But what seemed like just another teen movie was really a call for a revolution. A questioning of the status-quo. When Ramones mega-fan Riff Randell challenges principal Miss Togar’s rules and regulations on her and her fellow classmates’ right to rock, she wasn’t just fighting for music, she was questioning the longtime systemic oppression that standardized schooling can produce. She was fighting for student rights and demanding reform of the educational system, as well as stealing back a pair of Ramones concert tickets from the principal and trying to extend her curfew! The students joined together (one could even say unionized) against parents, teachers, and principals to incite a monumental and not so quiet riot. Yet on the other hand, this movie could be considered a perfect example of what happens when the education system is left up to parents and teachers with no regulation. Burning up a bunch of records is shameful— it’s just as ridiculous as requiring kids to use symbols to communicate when they are perfectly abled to speak up. The film takes an absurdist, punk rock, silly, yet splendidly anarchist look at the danger of putting blind faith into a movement; it shows what happens when the system is put into the wrong hands. So while Rock n Roll High School could easily be written off as a classic campy tale of coming of age and teen rebellion and although in the end the students took it a bit far and actually burnt the school down, this film is clearly just a carefully shrouded metaphor for the problems with both public and charter school systems, the ability to rock, and the endless debate over educational reform in the United States. Obviously.